With Capcom's legendary Street Fighter series enjoying its 30th anniversary this year, there is a lot of history and nostalgia behind this line of games, and it should come as no surprise to learn that there's plenty of merch to invest in as a result. To celebrate the long-awaited release of Ultra Street Fighter II: The Final Challengers on Nintendo Switch this week we've rounded up some of the most interesting Street Fighter merchandise for your consideration. To kick things off, first we'll need the game itself. 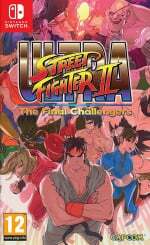 Ultra Street Fighter II: The Final Challengers takes players back to what has to rank as the most popular entry in the series - Street Fighter II - and with a host of new control options, multiple game modes, online play and the inclusion of Lite controls for newcomers, friends will be able to experience Street Fighter in a whole new way. 8Bitdo has just updated its excellent range of retro pads so that they now support the Switch, which makes them perfect for playing Ultra Street Fighter II. If you don't have one of these already and you're planning on getting the game, a purchase is highly recommended. While the live action Street Fighter movie featuring Jean-Claude Van Damme and Kylie Minogue was never going to win an Oscar, there is always the rather lovely anime to wash that bad taste out of your mouth. What better way to show off your appreciation of all things Street Fighter than a lovely t-shirt or hoodie? We've got some winners for you here! Last but not least, here is a round-up of other great Street Fighter-related items which might take your fancy. We hope your enjoyment of Street Fighter is greatly enhanced with these lovely items. Let us know if you have any favourites which we missed by popping a link down below! The street fighter group t-shirt looks pretty cool. I already own the animated movie on blu-ray and definitely recommend it to anyone who hasn't seen it. Somehow it seems all the more appropriate now with the inclusion of 'Violent Ken' in the game. I already have all those Blu Rays and the Amiibo. I just NEED THE REST OF IT. So, how do these 8bitdo controllers work? How'd they update a controller? Does the Switch recognize them as a Pro Controller? That Street Fighter Movie by Van Damme was a Huge Disaster ! This Street Fighter parody from City Hunter Movie by Jackie Chan was even Much Better. Happy watching ! As usual these are not "deals", but just stuff for sale at full price. I'd go for the Monopoly, (Character) Select Screen, & sprite mugs, the men's group t, & the Ryu amiibo. Oh, yeah! Those Pro controllers are beautiful looking! If I had to pick 2, it'd be the Select Screen mug, & monopoly. As for the controllers, any of 'em look great! From a collector's perspective, you could resell these, & make a profit, without price-gouging. Better for business to be reasonable, (rather) than (being) greedy. The merchandise is better than the actual game release. It's All For The Greater Good! $33 for SF Monopoly? What a ripoff. I paid $14.99 for it new at Half-Price Books. SF II the Animated Movie is actually really really good. I love that movie. If you've ever liked anything about SF you owe it yourself to watch it ASAP. I like some of the mugs and I already own a lot of this merch being a SF fan... some of the prices are a bit much for what you get though. Can't wait for my figma of Ryu and Chun-Li to show up. Street Fighter:LoC-L will never, ever enter my domain upon pain of death. What a train wreck. I'll take Ming Na Wen's version in SF: The Movie any day of the week. Another call to watch the Anime. Its truly excellent. The live action movie is terrible but I love it in a strange way. Kylie is an awesome Cammy, even if it annoying when Americans cast Aussies as Brits. Kylie can be an honourary Brit as far as I am concerned, but in movies, the accent can't cut it I even enjoy the genuinely awful game based on the film, its like SF2 and Mortal Kombat 1 had a baby. I have a few of the SOTA SF action figures and they're among the best I ever bought. Gorgeous! @YouSeemFRAZZLED Yes they are all recognized as a pro controller. They work really well too!